If you are looking for the perfect Fall dessert, this is the one you have to add to your list. 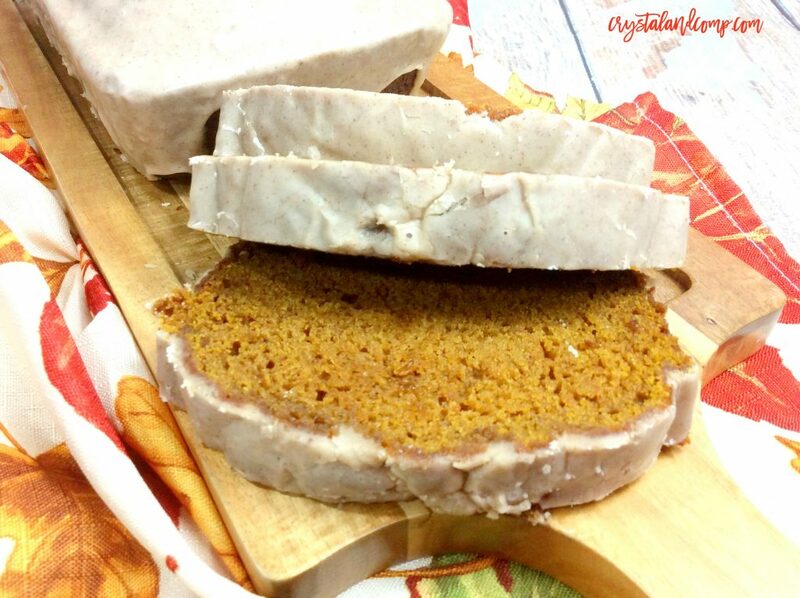 It’s one of our favorite pumpkin spice recipes! It’s magical. It’s layered. It’s pumpkin. It starts with a boxed cake mix. 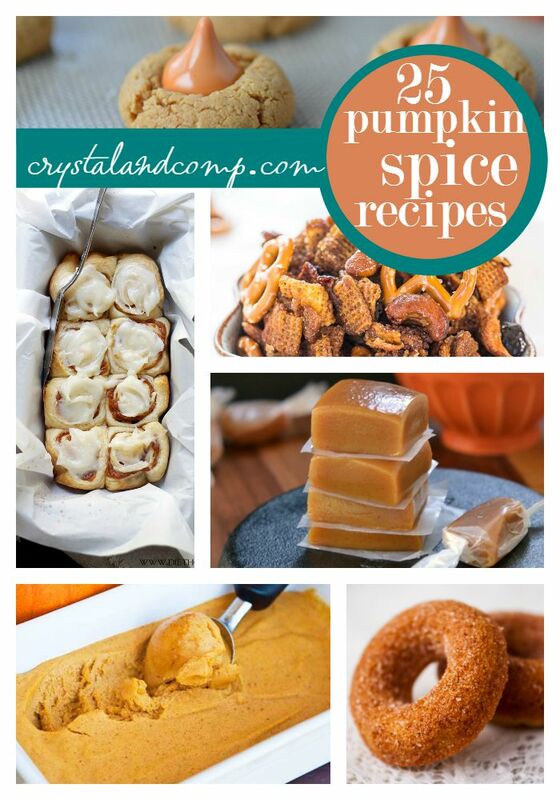 Includes pumpkin puree. And a jello and whipped cream topping. 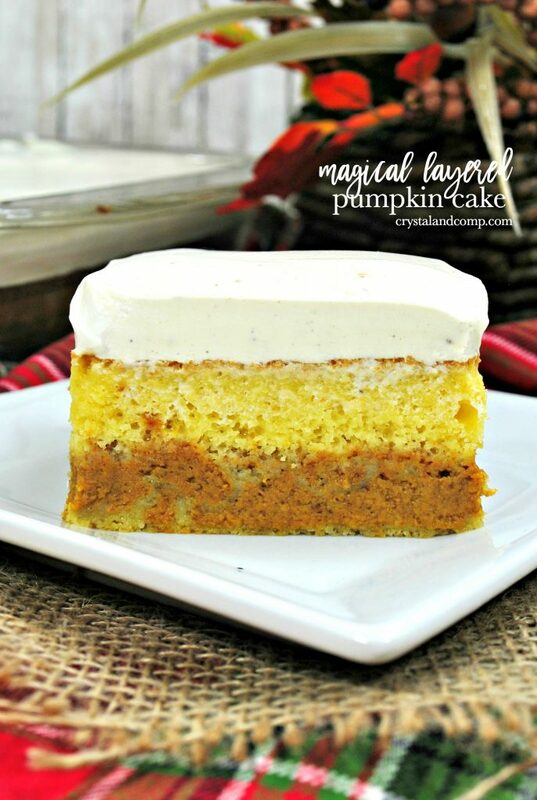 It is perfectly named Pumpkin Magic Cake. Let me show you how easy it is to make. First, you want to preheat your oven to 350 degrees. Grab your 9 x 13 cake pan and spray it with cooking spray. Set it aside. Make the cake mix according to the directions Pour the prepared mix into the cake pan. Set it aside again. 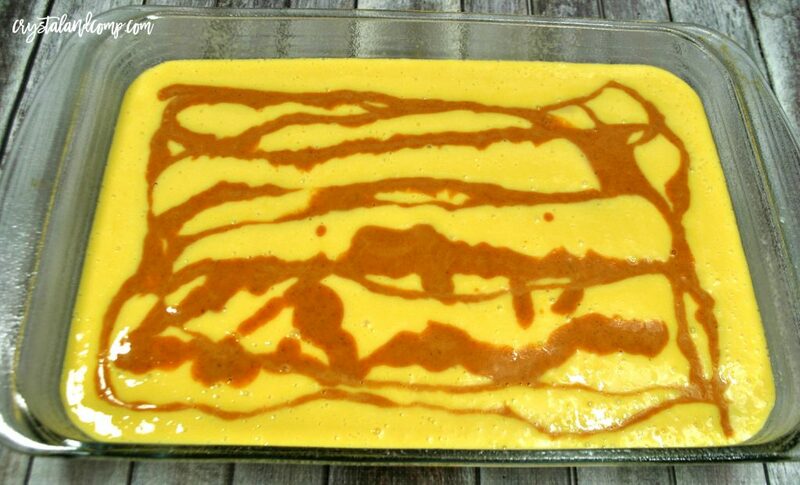 Whisk together the pumpkin puree, pumpkin pie spice, evaporated milk, heavy cream, eggs and brown sugar. Mix it until smooth. Very gently pour this mixture over the unbaked cake mix. Don’t dump it all in one spot, distribute it evenly throughout. Pop the cake in the preheated oven for 50-60 minutes or until a toothpick inserted in the middle comes out clean. 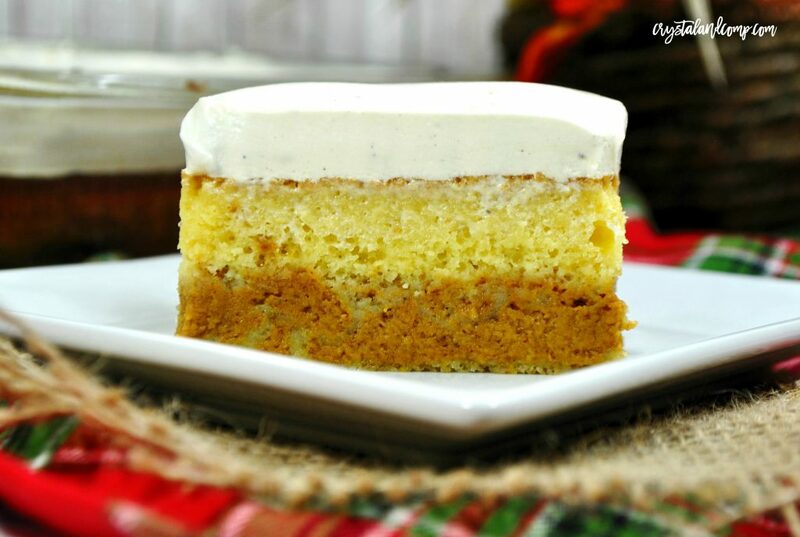 Notice how the cake cooked into layers on it’s own? It’s so pretty! Now, let’s make the frosting. Take the pudding mix package and dump it into a large bowl. Add the pumpkin spice and milk into the bowl as well. Whisk to mix and it will thicken. Once it starts to thicken add the Cool Whip by gently folding it until it is smoothly combined with the pudding and milk mix. Scoop it all over the top of the cake once it has been removed from the oven and is 100% cool. This is a cake that does best when it is chilled. Pop it in the fridge for a few hours and then serve. Do you love pumpkin, apple or chocolate desserts? Let me just say, one of my favorite things about Fall is the desserts. 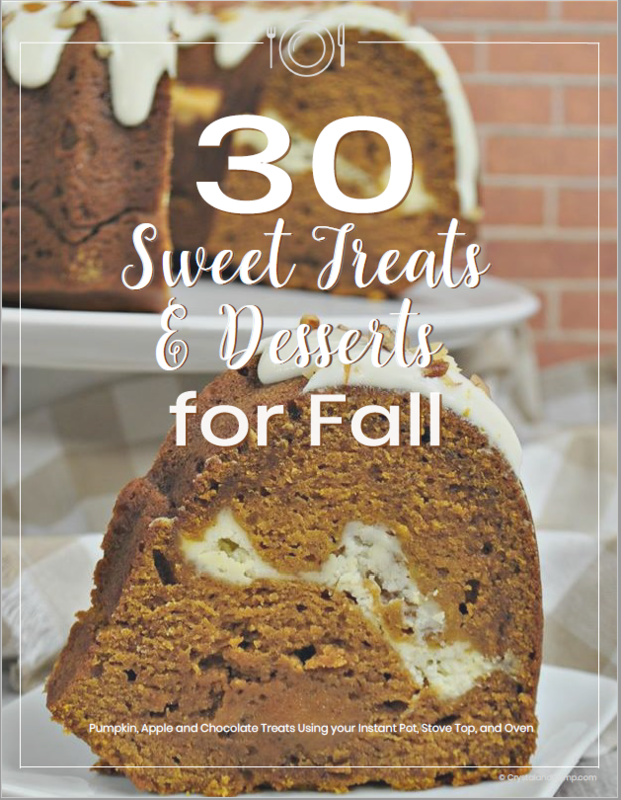 We have pulled together our favorite 30 Fall Dessert Recipes. You can download it instantly by clicking the image below. Very gently pour this mixture over the unbaked cake mix. Don't dump it all in one spot, distribute it evenly throughout. 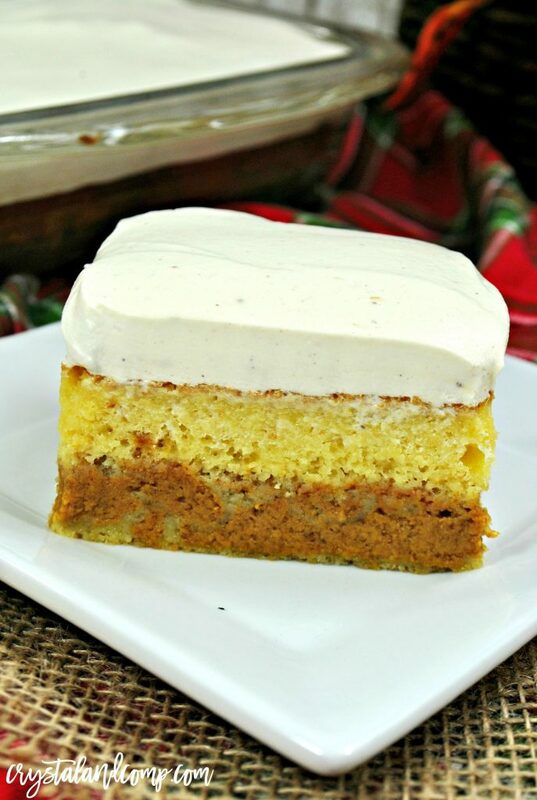 Notice how the cake cooked into layers on it's own? It's so pretty! Now, let's make the frosting. 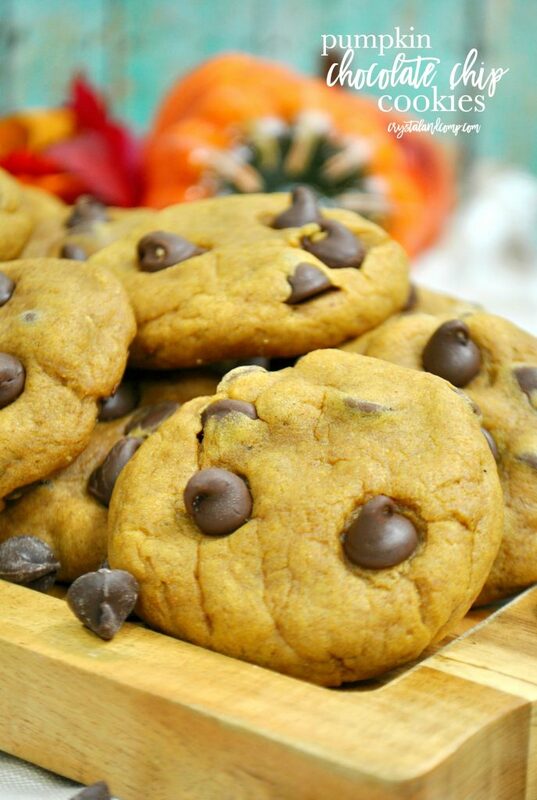 These pumpkin spice chocolate chip cookies are awesome! 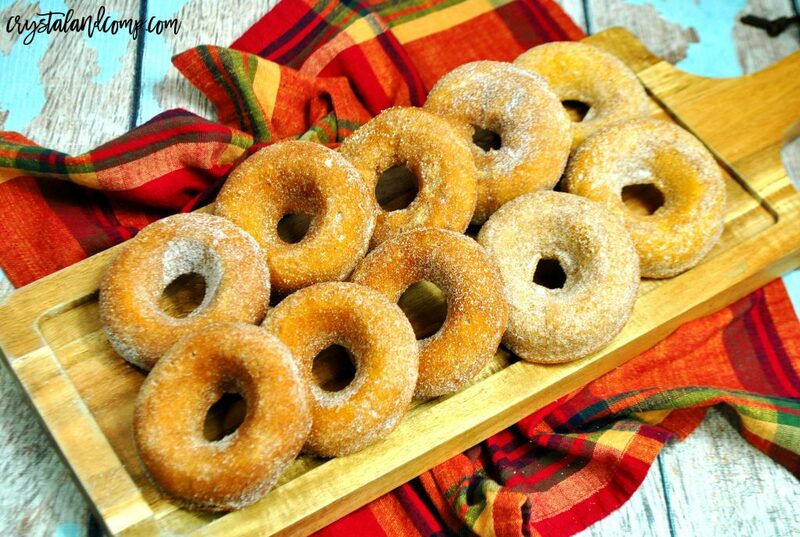 Your kids will have you begging for more of these Pumpkin Spice Donuts! There is a bakery not far from me that makes and sells homemade pumpkin bread. I’ve never had anything like it before. I love to buy it this time of year and give it as gift. But it got me thinking, I bet I could make this at home. 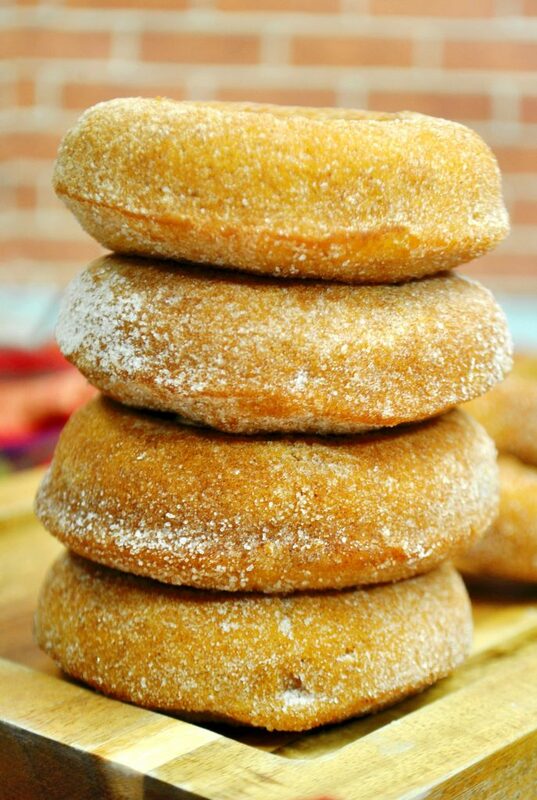 And what if we added a glaze to the top? And so we created this…. I think you will love it as much as we do. Grab a loaf pan and spray it with cooking spray. Set it aside. I love to use my standing mixer for this, but you can use a hand held instead if you want. Combine all the bread ingredients and mix well on medium speed until well combined. Pour the batter into your loaf pan. Pop it in the oven and bake for 55-65 minutes. When it is done a toothpick or butter knife should come out clean when you poke it in the middle. Let the bread cool for 30 minutes before removing from the pan and placing it onto a wire rack. Otherwise it might break as you try to take it out. I would set the cooling rack on top of a cookie sheet. Now, let’s make the glaze. Grab a large mixing bowl or use your standing mixer again. 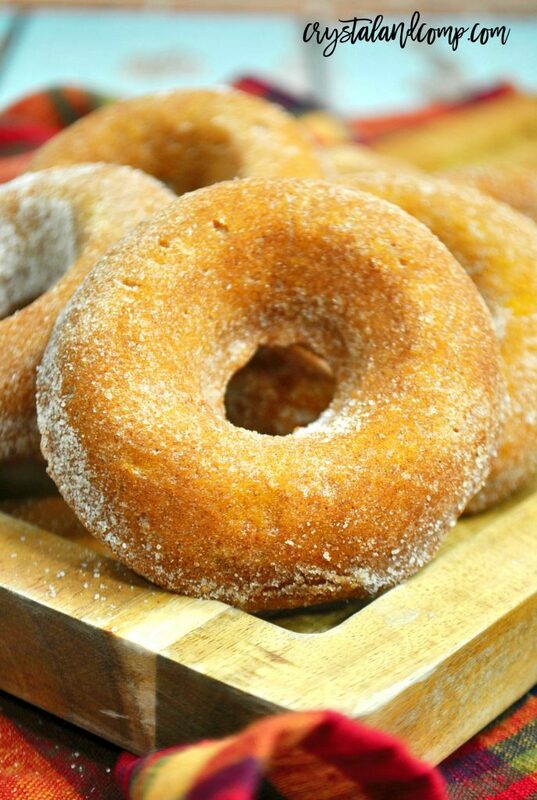 Combine the the powdered sugar, maple syrup, cinnamon, and milk. Pour the glaze onto the bread and allow it to drip onto the cookie sheet. 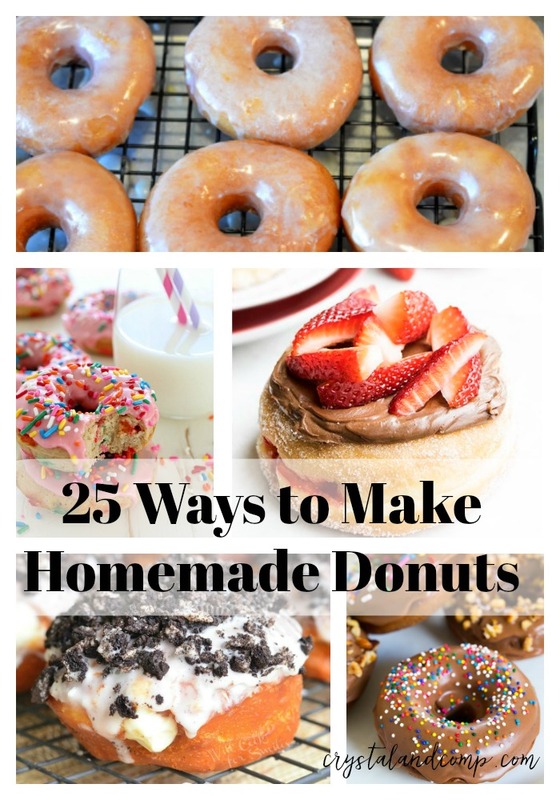 Let the glaze set for an hour… then devour! 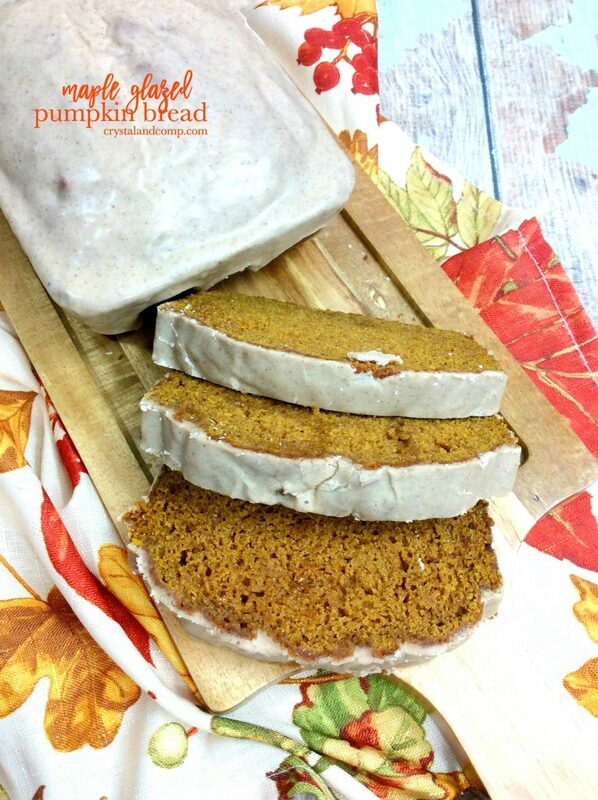 The perfect homemade pumpkin bread with a maple glaze topping. Now, let's make the glaze. Let the glaze set for an hour... then devour!